Gene Fowler once said that every publisher should have a pimp as an older brother, so he’d have someone to look up to. Every writer, and nowadays a lot of readers, will appreciate the justice of that estimate, but $4.95 for a 63-page book is still an act of what the French might call magnificent outrage. That’s better than seven cents per page and it’s not even printed on gold leaf. However, after one is through reflecting on the avarice of publishers, this little book doe’s deserve a hymn of praise for the research and wit it contains. Only narcs and the major drug dealers, that oddly symbiotic alliance, can possibly oppose the self-evident intent of the authors, which is to teach the reader how to make pure, undiluted, 100 percent safe neurochemicals at home, and thereby avoid the hazards of the black market. It is indeed a splendid dream. Imagine: every Head in the country begins growing his or her own magic psilocybin mushrooms. Funny fungi sprouting everywhere. Millions, then billions of golden-headed darlings bringing the most ancient Mayan secrets to meta-phase nervous systems, coast to coast. The local distributor of mescaline-cut-cut-with-garbage, which he calls LSD, pounds on the door desparately, “Hey, I’m selling blotter at 10 cents a hit this week” — and nobody answers. The narcs race frantically from window-box to window-box sniffing for forbidden spores, but they know in their bones it’s a hopeless task: who can arrest the spread of a versatile fungus that duplicates both sexually and somatogamically? 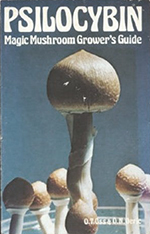 I am told by those who have more botanical savvy, than myself that the methods in this book really work and can produce huge and fulsome mushroom harvests anywhere in the world, despite climate and weather variations. You can grow them in your own pad: no garden needed. In a closet at the place you work. Under the stairs at City Hall. Have a little bit of mystical old Mexico with you wherever you go. I must add that, for me, the most enjoyable part of this book is the introduction, in which the authors offer their own theory about the origin and goals of the magic mushrooms. Well, yeah: anybody who’s been into deep meditation with the sacred mushroom will buy that. Hell, I’d believe that Psilocybin came from outside the light-cone entirely: beyond space-time, from Wheeler’s super-space or Plato’s Ideal World. 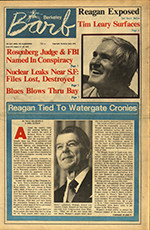 by Robert Anton Wilson appeared in Berkeley Barb, Issue 574 in August 1976.